I think Heston may have garnered a few ideas from Mr. Dali. Dali wasn't the only one who enjoyed hosting bizarre dinner parties. If you found yourself at a dinner party hosted by the 2nd Baron de Rothschild, you may have discovered yourself sitting next to a chimpanzee. 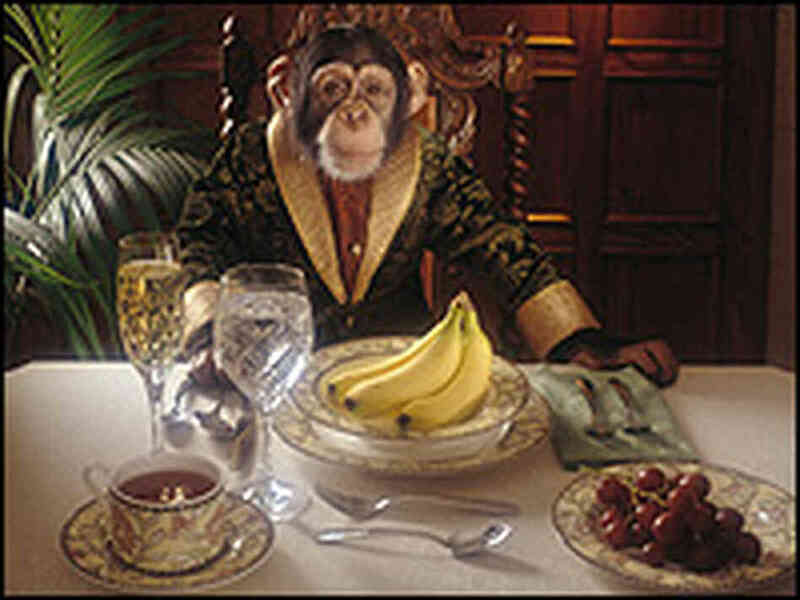 He once famously hosted an important dinner for Lord Salisbury and when the guests were seated they found themselves joined by 12 immaculately dressed monkeys. Or how about Francis Egerton 8th Earl of Bridgewater? Here you will discover a man who liked to throw a dinner party. The surprise though, is that his preferred guest was of the canine persuasion, for he liked nothing better than to host lavish affairs for his dogs, dressing them up and feeding them a variety of fine food offered up on silver platters by his butlers. The image puts me in mind of the famous paintings by C.M. Coolidge of dogs around the poker table playing cards. As a child, I found those images quite captivating. You might have feared being invited to a dinner hosted by the Victorian eccentric and geologist Dr. William Buckland. He gained notoriety for his love of consuming all manner of things. He was known to try anything from mice to elephants. Allegedly, when presented with the heart of Louis XIV, displayed in a silver box, he proclaimed he had never eaten a king’s heart before and promptly popped it in his mouth. What about the MP ‘Mad Jack’ Mytton of Shropshire? He once hosted a dinner party and made his entrance to the dining room riding a bear. You needn't have even been attending one of his parties to find yourself the victim of one of his pranks.He once rode his horse into the Bedford Hotel in Leamington Spa, up the staircase, then he and the horse jumped off the balcony over the diners in the restaurant below. Even the Romans liked a few larks at their parties. The young Emperor Heliogabalus who was just 14 when he rose to the throne, would throw lavish and expensive dinners where guests could expect pranks and games to be played as part of the proceedings. It is said that here we may have found the world’s earliest whoopee cushion. You might have found yourself led to the dining room only to encounter his pet lions as a little joke, just to scare you. However, he was also a generous host and you might find some gold or pearls hidden amongst your rice and peas. He often gave away houses or chariots and sometimes even slaves. Antics such as these certainly give us food for thought when considering our next dinner party. Of course we would all like our dinner parties to be legendary but most of us would just settle for a well laid table and delicious food that will hopefully be remembered long after the last morsel has been eaten. In view of that, I present to you our well laid table but I'm afraid the menu is up to you. Please visit our pinterest page for some inspirational ideas and lovely ways to serve up your next dinner with style. All items from I.Franks Antique Silver. For all enquiries, click here to contact us. So next time someone plays that game where you're asked which three figures from history you would most like to invite to dinner why not turn the tables and ask which three people's dinner party you might like to attend.